So, being the proud father of a 7 year old, I tend to spend more time than I could possibly admit watching something called Ben Ten Alien Force on Cartoon Network. Ben's Grandpa Max drives around in a mobile laboratory stuffed to the gills with the most high-tech gadgets you can imagine. Occasionally in the cartoon you catch a glimpse of the vehicle itself and it seemed strangely familiar to me... A little internet research and, sure enough it is a GMC. 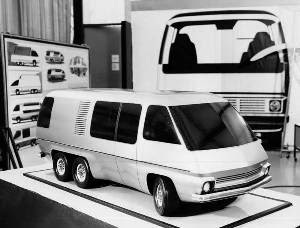 I think it says something about the design of this coach -built for just five years in the mid-seventies - that its been chosen for a role in what is probably the most popular children's cartoon series on TV at the moment. Thirty years after they stopped producing them its still futuristic enough to be thought of as cutting edge. Actually there are lots around but this is the only one that looks like it was made by Matchbox. Flames! And a matching vintage style scooter on the back! Inside it has a leopard print theme and is deeply funky. Its available now at Vintage Trailer Crazy. You really are an angel. I don't know how I can thank you. I really am still just completely flabbergasted by all this. It feels like a dream. I wasn't able to tell anyone what you had done, without crying all over again. Your generous spirit and kindness are such a welcome shot in the arm right now. This is the last thing I expected to hear when I called you. Knowing that there are so many kind souls out in the community in this time of life is simply uplifting. I knew that the GMC community was tight knit and full of great people, but this just blows me away. I guess that we will have a few more stops to add to our list of places to go and people to see, and thank. I can't wait to get this show on the road so to speak, I think that will be a good way to start. Words can never fully express my gratitude enough. How can I repay these tremendous acts of kindness? I will try to honor them and hope to see each and every one at some point to personally thank. This was the concept and really, how cool is that? Its like an illustration in one of those magazine articles from the seventies that predicted we would all have jetpacks by the unimaginably distant year of 1998. 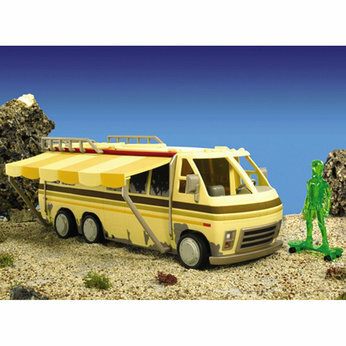 This RV model is clearly the mass transit vehicle we were going to use on the moon once Disney established a resort there. I've discovered its all too easy to lose vast chunks of time navigating the technical and social complexities of GMC.net; the central online clearing house of all GMC Motorhome questions and answers. With most owners now around retirement age (it seems), many have plenty of time to contribute, to the extent that I get about ten email summaries of contributions every day. Its quite extraordinary, but then, so is the level of expertise. They represent a bygone age of hands-on engine maintenance, that was replaced by computers in about 1985. So, want to fit a fuel injection system in your seventies classic? Re-wire it? Add new fans, filters, airconditioners, lights or steps? Upgrade it in any way imaginable? Yup, they can do all of that with photos of how, and the right imperial measurements for the stuff you will need to do it. Just occasionally in this forum though, there are spats. Someone oversteps the mark in terms of criticising someone else's disk brake decision, or their recommendation for a four bag air suspension setup. Then there are tantrums. Several people this year have stormed off the forum in an emailed huff, saying if their advice is no longer useful then they will no longer offer it and don't expect to see them contribute ever again and I really mean it. Its all very interesting. 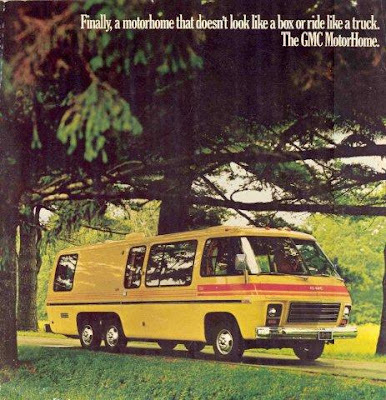 So yes, if you want that Airstream chic, mated with the classic V8 power of an Oldsmobile Toronado, the GMC Motorhome is not your only option. 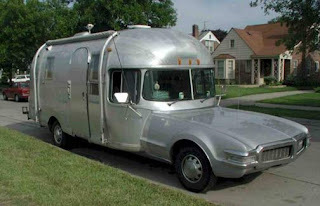 This photo from the excellent Clunkbucket blog ("everything but the same old cars") suggests that all you need to do is, er bolt an Airstream to the front end of a Oldsmobile Toronado. I wonder why it never caught on? I just got off the phone with Tom in Woodbridge who gave me some great advice about what to look for in one of these coaches. He thinks prices have come down a lot and $15,000 would get a good one. He also offered to come out with me and check one over, if our little fantasy ever veers within striking distance of reality. They are a friendly bunch these GMC owners. Leigh, who showed us his coach on Wednesday, said he was still struck by the fact that every GMC owner he had ever met was a nice person. To good to be true? Well not so far. OK now some context for the, er, striking interiors. 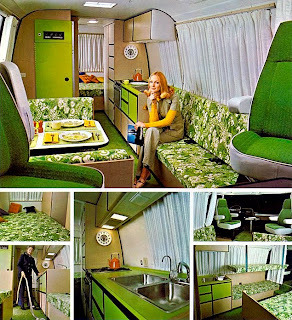 It turns out that the GM President back in The Day, Ed Cole, thought it very important that the interiors were colourful (and indeed they are). His Chief Engineer, Wally Edwards was sitting across the table from him in a design meeting wearing a classic seventies kipper tie with vivid orange stripes and Ed decided that "one of the colours should be like Wally's tie". It was. Judging from this photo, Wally also had a rather green tie too. 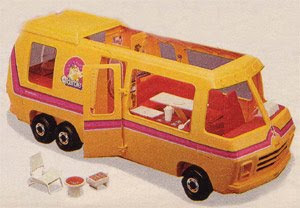 So according to the GMC engineer here, the Magic Bus was to be found in quite a number of celebrity driveways (and not just Ken and Barbie's). "Sammy Davis Jr., Sheryl Jones, James Garner, Lindsay Wagner "The Bionic Woman", Bo Swenson and Frank Sinatra Jr., to list just a few, - all loved their GMC's". Hard to imagine Sammy and Frank folding out those sofabeds, or the Bionic Woman plugging in the built-in vaccum, but James Garner, yup he would have had a GMC (perhaps he still does). As Jim Rockford he had the iconic gold Trans-Am and lived in a trailer by the beach. You bet he would have traded up to a GMC in a heartbeat. Can there be any more definitive piece of classic seventies Americana than the Rockford Files? I think not. Mr Garner, I salute you. So, who knows. We don't know where we will be next summer - probably London, but if we are still here I can see us in one of these on another great road trip. And if we aren't, this journey will have been fun all the same.